The Little Big Voice website is up as a record of the other weekend down in Wales. It's lovely. The handwritten notes on the frontpage are a really nice touch. 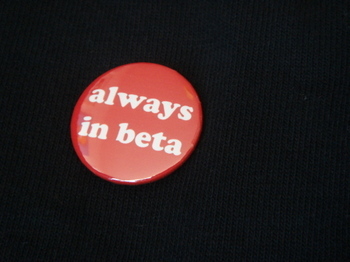 Lots of people seemed to like the 'always in beta' badges I handed out while I was there and Dave suggested they might make some up as t-shirts which would be splendid. Before I nudge him about that (because I'd like one) does anyone else want one? Not sure how much they'd be, but any interest in principle? Yup. Make it XXL, though. I can think of an outlet for two Russell. Not in red though please! T-shirts maybe, badges yes please! Aah.. I'd love one of those t shirts. As long as it can shipped to India PLS! would be great - can see one in my collection in xs, grey if that's possible. Yes yes yes yes. I want two to be shipped to India. high interest from this corner. yes please! Yes please. My 'Geek 3000' t-shirt is falling apart. Where's my free badge? I didn't pay for it ages ago and it still hasn't arrived. I want one that says 'I can't believe it's not Beta' And I want a FREE shirt because it was MY idea and also please send one to my friend Pete. Could I ask for one please?